Site collection administrators have God like power within a Site Collection in SharePoint 2016. 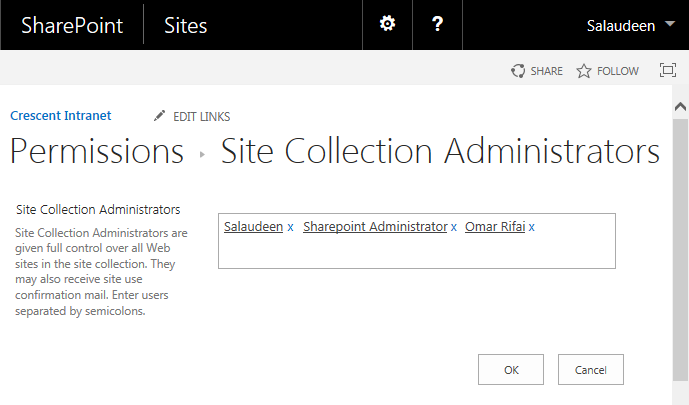 Apart from Primary & Secondary site collection administrators, we can add additional site collection administrator on any SharePoint site collection. How to Add a Site Collection Administrator in SharePoint 2016? Click on "Site collection administrators link under "Users and Permissions"
Enter the New user in Site Collection Administrators Field. Click OK to save your changes. OK! Now, How about adding a same user as administrator in all site collections? You can use Web Application User Policy in Central Admin to give Full control to the Entire web application, instead of adding users into individual site collections!